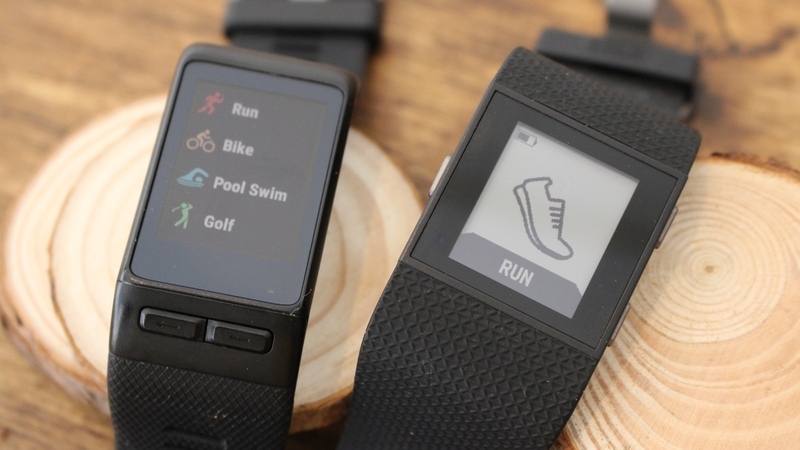 The Fitbit Surge is the daddy of the Fitbit trackers. The Blaze might be the new kid on the block, but this fitness superwatch is for those who are not just about counting steps. It packs in GPS and a heart rate sensor and offers all the same activity tracking features you'll find on other Fitbits. But it's not alone in catering for all of your sports tracking needs. Step forward the Garmin Vivoactive HR, the second-gen sporty smartwatch that also packs in GPS and a heart rate sensor plus has dedicated tracking modes for a host of sports including running, cycling and swimming. With feature sets that are so similar, comparisons between the two fitness-focused watches will inevitably be made. But which one warrants your attention and the money from your wallet? We've already had our say on the Surge and the Vivoactive HR individually, and now we've lived with both for a while to see just how they match up. Want a stylish looking fitness watch? Then we'd suggest looking elsewhere. It's all about sporty ruggedness here and while the Surge is available in more colours than the Vivoactive HR, they don't exactly elevate it over the Garmin for attractiveness. The Vivoactive HR is the slimmer of the two and feels a little lighter around the wrist, but in reality both sit comfortably on the wrist all day and night. The textured rubber straps have striking similarities with a watch-style clasp, making sure they stay put. The good news is that both offer different sized straps – but the Vivoactive HR is alone in offering the option to let you swap out the regular strap for a more eye-catching colour. You do have to pay extra for that luxury though. Both have zippy touchscreen displays with Fitbit opting for a squarer 1.25-inch LCD monochrome affair, while the Vivoactive HR has a slimmer colour display. We say colour, but it's very muted and nowhere near as vibrant or as sharp as you'd find on an Apple Watch or an Android Wear watch. Visibility is not an issue in the day although the backlight on the Surge makes it better equipped for those nighttime workout sessions. There are physical buttons on both the Surge and the Vivoactive HR, which are useful when you need to interact with the watches on the move and swiping on the touchscreen is more difficult. What could be a deal breaker for some is waterproofing. The Surge is water resistant to 5ATM (up to 50 metres), which might sound like you can take it for a dip, but Fitbit suggests you don't go any further than running in the rain or drenching it in sweat. The Vivoactive HR is waterproof up to 5ATM and you can go swimming with it. Swim tracking is designed for a swimming pool, not open water, but we had no issues when we took it out in the sea. Both pass the shower test as well, although it's not recommended you take the Surge in with you when you're having a wash. So which one did we prefer wearing on a daily basis? There's really not much in it, but the Vivoactive HR's slimmer design and waterproofing gave us less reason to take it off. We didn't suffer any skin irritations with the Surge thankfully and it's perfectly fine to wear 24/7. Just as long as you give it a wipe down every now and then. So let's get to the nitty gritty. How well do the Surge and the Vivoactive HR track your life? Let's start with what both offer on that front. With the Surge you can track steps, sleep, calories, 24/7 heart rate data including resting HR and active time. There's also GPS built in so you can leave your phone behind and it also includes an altimeter to track elevation. You get pretty much the same with the Vivoactive HR, although it does additionally offer GLONASS alongside GPS to give stronger satellite coverage for recording your running and cycling routes. As far as daily activity tracking goes, both offer consistent data and there wasn't a big disparity between distances and step counts. Both are based on their own software algorithms so the chances of the data being identical is always going to be slim. We were happy to say they were in the same ballpark. It's a similar story with the auto sleep tracking. Both offer baseline data and the accelerometer based tracking delivers consistent sleep data. Fitbit does offer a new sleep schedule mode, but it's hardly revolutionary. When it comes to reviewing that data along with daily activity tracking, Fitbit's app offers a more streamlined experience in comparison to Garmin's Connect app. Fitbit does activity tracking best and it shows. As far as keeping you motivated goes, the Garmin wins for us. The inactivity Move bar and the adaptive step goals do a considerably better job of keeping you moving and for gradually becoming more active day by day. Garmin has recently introduced its new Insights software which will offer you advice like the benefits of a good night's sleep. But it's not quite at Jawbone's level of putting your data in the context of your day-to-day life. Both offer multi sport tracking, with the Surge focusing on running and cycling. The built in accelerometer also offers run tracking when you swap the park for the treadmill. For other activities like yoga or Zumba, you'll get very basic metrics like workout duration and average heart rate. There's also a stopwatch and a SmartTrack feature added to log activities automatically. When you compare that to what the Vivoactive HR can offer though, it's a whole different ball game. It packs in dedicated modes for running, cycling, swimming, golf, rowing, skiing and a whole lot more. It's not just baseline metrics here either. You're getting the kind of data you'd want if you're hitting the slopes or having a round of golf. The biggest new hardware feature on the Vivoactive HR is, as the name suggests, the addition of a heart rate sensor. It's the same optical based Elevate tech featured on the Vivosmart HR+, Fenix 3 HR and the Forerunner 235, which is located on the inside of the strap. The Surge uses the Fitbit-developed PurePulse heart rate monitor, an optical sensor that flashes lights against the skin to detect changes in blood volume. From a resting heart rate perspective, we took five readings with the two watches while also wearing the Polar H7 heart rate monitor chest strap, and readings were accurate. The Vivoactive HR can display some erratic recordings initially, but once it settled down we were happy with the readings. We also took both models running in the gym, pitching them against the Polar H7 heart rate monitor chest strap paired to Polar Beat on the iPhone to see how the continuous heart rate data fared. After a 20 minute session of interval running, both heart rate bpm averages and maximum heart rate readings were pretty accurate. The Fitbit data appears to deliver higher bpm readings at the beginning of the session before levelling out and matching the Garmin with what the Polar heart rate chest strap can deliver. For GPS pick up, the Vivoactive HR was noticeably quicker than the Surge, which could take more than five minutes at times to find a signal. You do have the option to quick start as the watch continues searching for GPS, but as far as reliability and speed is concerned, Garmin comes out on top. We've talked up Garmin's approach to notifications before and it's more good news with the Vivoactive HR. Once you've configured phone notifications from the Garmin Connect app you can expect alerts including third party ones to flood through with little delay. You can't respond to texts, emails or alerts. You can only clear them from the screen and they can look a little crammed on the slim display. But it works well and does a better job than most dedicated smartwatches. If you want to control music from your phone as well, it's pretty adept at doing that too. So now over to the Surge where things get a little more basic. If you care about notifications about calls and texts, then you're well catered for. Anything more than that and you're out of luck, as Fitbit's watch doesn't do third-party app notifications right now. It doesn't support calendar alerts either. You can control songs during a workout though and the display is a good size for checking in on track info. On paper, there's only one winner here and that's the Vivoactive HR. Garmin promises up to eight days when used in smartwatch mode, with 24/7 heart rate monitoring switched on. That drops to 13 hours in GPS mode. In comparison, the Surge should deliver five days with GPS up to 10 hours. Fitbit or Jawbone - what activity tracker should you be rocking? That's pretty much what we've found in our testing. Both will get you through a week's use with two or three GPS sessions thrown in, but Garmin's watch can eke out that bit more despite having the constant stream of notifications and colour display to contend with. The GPS impact on battery life appears more severe on the Fitbit as well, so hats off to Garmin for managing to deliver as much battery life as it currently can when tracking activities. If price is a big factor in your decision making, the Fitbit Surge is the cheaper of the two wearables and currently costs £159.99. The Vivoactive HR in comparison is priced more expensively at £209.99. So what is that extra money getting you? We'd say the richer notification setup, the waterproof design and greater multisport tracking. So which did we enjoy using the most? We thought it would be a hard decision, but after a couple of weeks using these fitness watches, there's only one we'd continue using and that's the Vivoactive HR. While the Surge still excels for basic activity tracking and the hardware is more polished, those who care about going beyond basic tracking will get more from the Garmin smartwatch. We still think Garmin could learn a thing or two from Fitbit on the software front, as its Connect app is a far more daunting place for beginners with so much information to take in. But if it's detail and data you want, then Garmin has plenty of both. Its smartwatch features are also more refined, while heart rate data and GPS performance make a far bigger impression than they do on the Surge. The Vivoactive HR's lacklustre design is disappointing but there are plenty of reasons here to prove that Fitbit should be very afraid of the competition. Still have some questions about whether to go for the Surge or the Vivoactive HR? Let us know in the comments section below.